Ventricular Septal Defect (VSD) is the most common congenital heart abnormality in infants and children, with equal frequency in both sexes. 25-40% of these defects close spontaneously by the age of two; 90% of those which close eventually do so by the age of ten. 70% are located in the membranous part of the interventricular septum (IVS) close to the pulmonary valves and artery, 20% in the muscular portion of the IVS (see figures 104b, 105a), 5% just below the aortic valve (causing regurgitation), and 5% near junction of mitral and tricuspid valves (atrioventricular canal defects). The consequences of a VSD depend on the size of the defect and the relative resistance in aortic and pulmonary artery beds. A small defect causes little disturbance, as the unequal increase in pulmonary blood flow is minimal. But if the defect is large, the ventricular pressures (right and left) are equal and the size of flow into the pulmonary and aortic, systemic (remainder of body) circulations is determined by the resistances in the two beds. 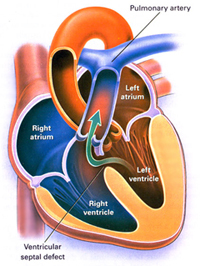 At first, the systemic, aortic resistance is greater than in the pulmonary, so the shunt of blood is left to right (see figure 112c). In time the pulmonary resistance increases, and the size of the left to right shunt decreases. When the pulmonary resistance equals or exceeds that in the aortic system, the shunt changes from left to right, to right to left.